The SSIDs page of your Linksys Cloud Manager allows you to create and edit wireless profiles. IMPORTANT: To prevent making changes to the wrong network, make sure to select the correct name from the network list. Similar to the image above, the name assigned to the network will appear on the top-left section of the page. A network can have unlimited SSIDs which are created in the SSIDs page (Think of these as wireless profiles). An access point can have up to eight wireless SSID slots. In any moment, a network SSID can be associated to one or more access points. On the Networks page, select a network. Click the SSIDs tab at the top. 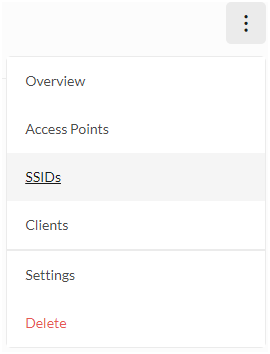 QUICK TIP: Clicking on the ellipsis icon of a network and going to the SSIDs link on the drop-down menu is also an alternative way of accessing this page. On the Networks page, select a network then click the SSIDs tab. Click the Create wireless name button. NOTE: If an SSID already exists, you will see the button instead. Enter an SSID in the Name field. Select the Password radio button to enable security. Enter your desired Password into the field. 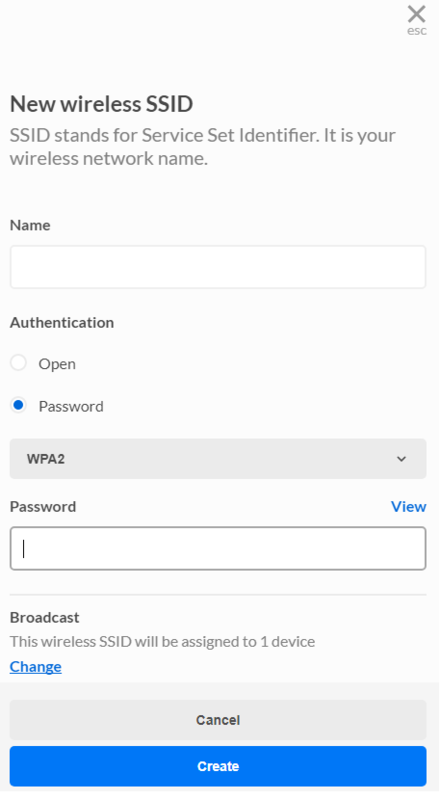 NOTE: The Linksys Cloud Manager only supports Open and WPA2™ Authentication. 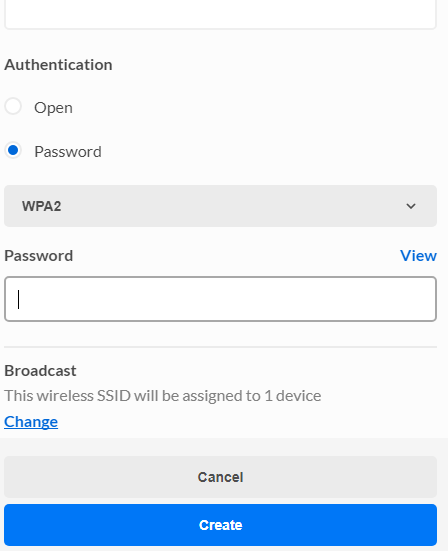 If your access point needs to support other Authentication types, you will need to turn OFF the Linksys Cloud Manager and manage your access point via the local interface. For a comparison on the access point management via the Linksys Cloud Manager versus the local interface, click here. Click on the Change link. NOTE: By default, the SSID will automatically be assigned to all access points in the network. If you want to assign this SSID to a specific access point, click the Change link under Broadcast and uncheck the access point you do not want to assign to this SSID. 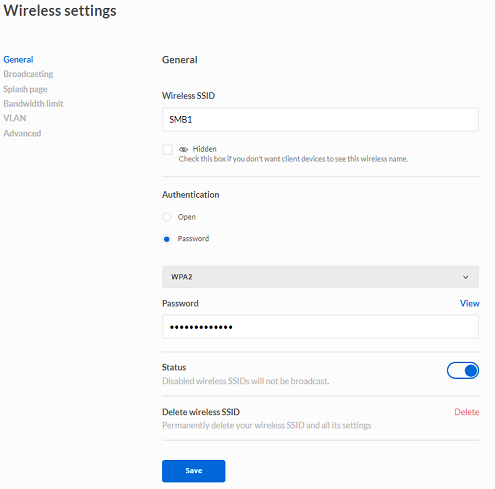 If you need to change the settings of an SSID, click on the Settings button of the SSID and go to the General page to review or to make changes. On the Networks page, select a network and go to the SSIDs page at the top section. Click the Settings button alongside the SSID you have selected. Under General, go to the Status section and toggle the switch to enable or disable it. Click Save. You can also select the ellipsis icon and select Disable. Under General, go to Delete wireless SSID and click on the Delete button. Click on Splash page. Select the Enabled radio button. Fill in the necessary information to complete the setup then click Save. By default, VLAN is disabled. 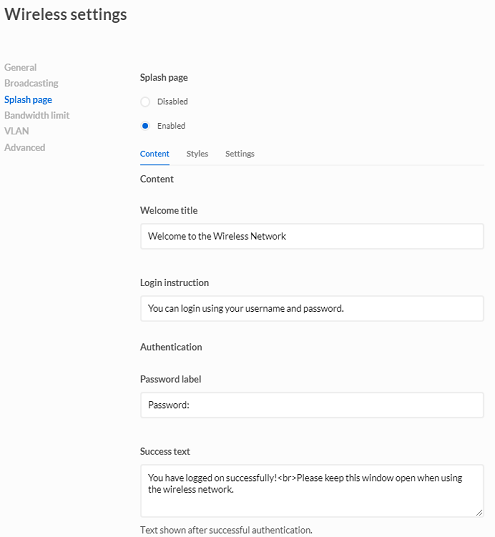 Enable VLAN to configure VLAN tagging on the SSID. 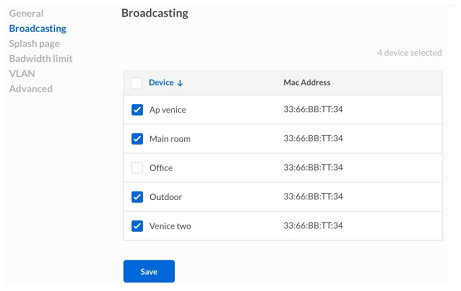 Through this page, a specific SSID can be configured to be broadcasted by several access points. Choose which access points to broadcast the SSID then click Save. 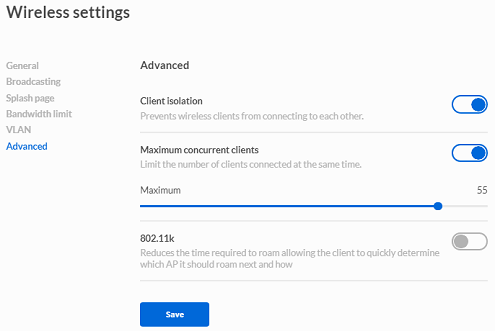 Clients connected to each SSID can be set to have bandwidth limitations. By default, this feature is OFF. Toggle the sliding switch to the right to enable it. To set limitation in Mbps, use the slider to set the Bandwidth limit then Save settings. If you want to manually set the bandwidth limit in Kbps, click the Advanced link. 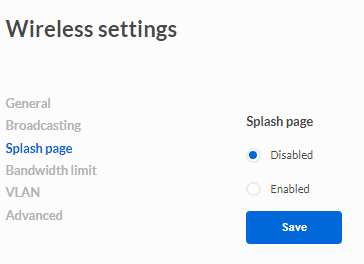 On the page that opens, you can then manually enter the Upload and Download values in Kbps then Save the settings. If you want to return to the previous page, click the Simple link. This section lets you configure Client isolation and Maximum concurrent clients. Toggling Client isolation to the ON position prevents wireless clients from connecting to each other within the same SSID. Client isolation is OFF by default. When it is OFF, clients connected to the same SSID and radio band will be able to talk to each other. NOTE: Based on your network needs, if you need your devices to communicate to each other on the same SSID and different radio bands, you will need to manage the access point using the local interface. For a comparison on the access point management via the Linksys Cloud Manager versus the Local interface, click here. When turned ON, limits the number of clients that can be connected at the same time. Default is OFF (Up to 64 clients). Reduces the time required to roam allowing the client to quickly determine which access point it should roam next and how.